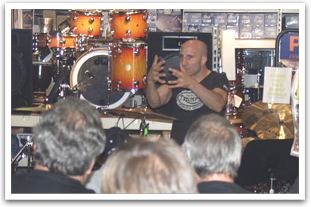 Kenny Aronoff is one of the world’s most influential and in-demand drummers. The list of artists he’s worked with reads like a who’s who of the music industry, and includes John Mellencamp, The Smashing Pumpkins, Bob Seger, Melissa Etheridge, Jon Bon Jovi, Elton John, Bob Dylan, Rod Stewart, Alanis Morissette, The Rolling Stones, Lynyrd Skynyrd, Willie Nelson, Waylon Jennings, Avril Lavigne, John Fogerty, Joe Cocker, Mick Jagger, Alice Cooper, Meat Loaf, Bonnie Raitt, Ricky Martin, Santana, Trey Anastasio, Michelle Branch, and many others. 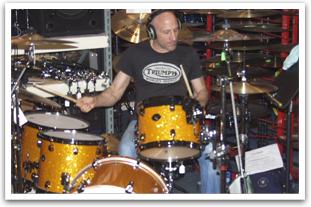 With a style of playing that combines power and finesse, Kenny was named the #1 Pop/Rock Drummer and the #1 Studio Drummer for five consecutive years by the readers of Modern Drummer Magazine, and in addition has played on over 30 Grammy-nominated recordings.